For twenty years Donna Ellerton has inspired, educated and motivated fitness instructors to become their own unique, personal best. 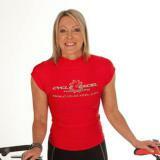 Donna has integrated her extensive knowledge as a cycling expert, international presenter, writer and business owner and created the worlds first online cycling portal, Cycle Excel. As an active master trainer for Cycle Excel she offers 3 levels of courses from beginner to advanced nationally offering new training ideas, CEC’s and PDP’s. All courses are registered with Fitness Australia and Physical activity Australia. The website offers regular updates and training information for instructors around the world.